Scoot, the low-cost long-haul subsidiary of Singapore Airlines (SIA), has not yet commenced commercial services but by announcing plans to launch Singapore-Bangkok it has already broken its self-proclaimed focus to only serve medium-haul and long-haul routes and not to overlap with short-haul sister carrier Tiger Airways. But rules are typically only guidelines when it comes to the evolving models of low-cost, long-haul carriers. In Scoot's case, deviating from its norm to open a daily Singapore-Bangkok service from 05-Jul-2012 allows it to boost aircraft utilisation and enter the gigantic Singapore-Bangkok market, the 26th largest route in the world based on available seats. It also allows Scoot to enter the lucrative Bangkok-Australia market with a connection product. Competitor AirAsia X already sees large transfer traffic from Australia to Bangkok via its Kuala Lumpur hub. Scoot's move into Bangkok could prompt a move from Thai Airways, which is already studying its own options for entering the low-cost long-haul market. Using partially owned subsidiary Nok Air to launch Boeing 777 flights to Australia is the most likely solution for Thai. Scoot's entrance in the Singapore-Bangkok market means the SIA group will have three brands in one market, something the group had initially wanted to avoid. SIA now operates five daily flights on the route while Tiger, which is partially owned by SIA, also operates five daily flights. Scoot will initially only operate one daily flight but its service could lead to capacity shifts within the SIA group as it is within 90 minutes of two SIA services and 35 minutes within a Tiger Airways service. In addition to being the 26th most popular route in the world bases on seats, Singapore-Bangkok is the 22nd most popular in Asia Pacific and ninth in Southeast Asia, allowing high local traffic on the route. But the route will also be appealing to Scoot's Australian passengers. Kuala Lumpur-based rival AirAsia X – which serves Australia's Gold Coast, Melbourne, Perth and Sydney – sees high transfer traffic from Australia to Thailand. AirAsia X's Australia-Thailand passengers connect onto services operated by sister short-haul carriers AirAsia (Malaysia) and Thai AirAsia from Kuala Lumpur to Bangkok and Phuket. AirAsia X also sees strong demand out of Gold Coast for connecting services to Bangkok. Thai Airways' only presence in the region is a five times weekly service out of Brisbane. AirAsia X offers connecting services (luggage is transferred and passengers are accommodated if there are any flight delays) on its own medium/long-haul flights as well as flights operated by other AirAsia affiliates. AirAsia (Malaysia) and Thai AirAsia collectively offer eight daily flights on current schedules between Kuala Lumpur and Bangkok, allowing for a range of connection opportunities from AirAsia X's variously timed Australian services, all of which arrive in Kuala Lumpur. Scoot's sole Bangkok service will allow it to conveniently connect with its Gold Coast and Sydney services, but only in one-direction for each city. Sydney-Singapore-Bangkok has a layover in Singapore of nearly 22 hours while Bangkok-Singapore-Sydney has a more manageable three hour layover. Gold Coast-Singapore-Bangkok has a layover in Singapore of two hours whereas Bangkok-Singapore-Gold Coast has a layover in Singapore of 23 hours. Scoot will likely look to optimise its Australian schedules once its network grows and it has more scheduling flexibility. Alternatively it could look to add a second Bangkok service to ensure quick connections in both directions. It could also eventually work with Tiger Airways to improve its connection product between Australia and Thailand. Tiger so far has elected against working with Scoot, believing partnerships are too complex for its simple point-to-point model. Tiger’s reluctance to at least initially work with Scoot, and invest in the technology that would be required to support codeshares or interlines, likely prompted Scoot to look at entering the Singapore-Bangkok market itself. Over time as Scoot grows, Tiger could be swayed to relook at partnering with Scoot and making the investments needed to support partnerships (investments many LCCs around the world have decided in recent years are worthwhile to pursue). Tiger’s move later this year from Singapore’s Budget Terminal into Terminal 2, where Scoot will be operating, will make feeding Scoot more feasible. Tiger may also prefer to start feeding Scoot if it can persuade Scoot to stick to its original plan of staying away from short-haul markets. 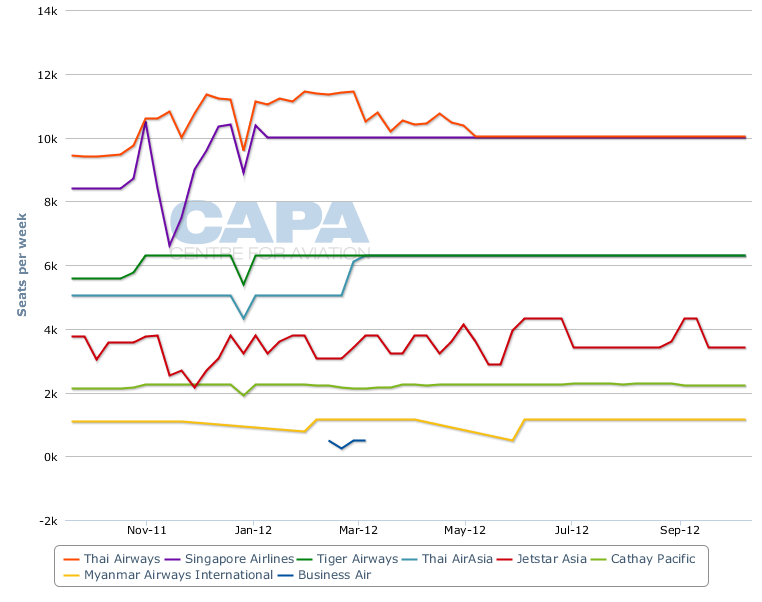 As it is Tiger faces stiff LCC competition in the Singapore-Bangkok market from Thai AirAsia and Jetstar Asia. Medium- and long-term prospects in the Australia-Thailand market could change if Nok Airways, the domestic Thai carrier partly owned by Thai Airways, decides to acquire 777s and serve Australia from Bangkok. According to industry sources, Nok – in cooperation with Thai Airways – is now studying joining AirAsia X, Scoot and Jetstar in Asia's fast-expanding long-haul low-cost market. Another one of the region's bigger LCCs, Manila-based Cebu Pacific, already unveiled plans earlier this year to enter the long-haul market. Thai Airways is now evaluating three alternatives for joining its rivals in the long-haul low-cost market: Thai could follow SIA in establishing an entirely new company for medium/long-haul low-cost services; it could use new hybrid regional low-cost unit Thai Smile to expand into medium/long-haul routes; or it could use Nok to expand into medium/long-haul routes. Industry sources say the first option is unlikely as it would take time to establish a new company and would require government approval (Thai Smile was established as a unit of Thai Airways rather than a separate company to avoid having to go through the lengthy and complex government approval process). Thai Airways has said widebody aircraft could be a future phase of Thai Smile’s expansion but this option is also unlikely in the near-term as Thai Smile is only launching short-haul services in July with its initial fleet of Airbus A320s. Sources say a study of potential medium/long-haul routes and different variants of the 777 is now underway at Nok, which would be prepared to launch a widebody operation as early as next year. Australia, including the Gold Coast and Sydney, is part of the potential network under study. Sources say the study at Nok is slated to be completed in August, leading to a decision by the boards of Nok and Thai (Thai Airways last year gained a majority of seats on Nok’s board after increasing its stake in the carrier to 49%). If approved, Nok would launch long-haul services likely in 2013 with 777s in two-class configuration. The operation would give Thai Airways a product in the growing long-haul low-cost market, allowing it to fend off increasing competition from AirAsia X, Scoot and Jetstar (Thai AirAsia also plans to consider its own medium/long-haul operation following its pending initial public offering). Thai Airways is already intending to use Thai Smile, Nok and a potential new ultra low-cost carrier as part of a new strategy to fend off growing competition from LCCs in the short-haul market, where it has been steadily losing market share. Nok currently only operates domestic services but is also now studying launching short-haul international operations with its newly acquired fleet of Boeing 737-800s. Sources say the carrier is also now studying a proposal to wet-lease Airbus A330s from Thai Airways starting later this year. The A330s would be used to enter the medium-haul charter market and is seen as a way to gain experience with widebodies before launching its own medium/long-haul operation. The Bangkok return service fits well in Scoot's aircraft utilisation. From 23-Aug-2012, when Scoot commences services to Tianjin (an alternative airport to Beijing), the carrier would have faced a ground time in Singapore of 10h30m. But with the Bangkok service, this will be reduced to 2h15m. While Scoot would obviously not drive up utilisation at the expense of profitability, having an aircraft on the ground with nowhere else to fly to reduces overhead costs. Since Scoot will operate 777-200s, the widebody nature of its operation should allow it to derive a lower seat cost than narrowbody competitors like AirAsia. Scoot's Gold Coast, Sydney and Tianjin services would require three aircraft so it was not possible for Scoot to consolidate flying to just two aircraft. While Scoot's aircraft performing Australian services will have layovers in Singapore of seven hours before commencing their next rotation, it is unlikely for Scoot in the short-term to look at more short-haul points. The available layover time would mean Scoot would have to look at destinations from Singapore closer than Bangkok (such as Jakarta or Kuala Lumpur) or create more available layover time to reach further points like Bali. Singapore-Jakarta is the most trafficked route with Singapore-Kuala Lumpur the fourth. Jakarta however is increasingly becoming congested and delay prone while passengers on both Jakarta and Kuala Lumpur favour frequency owing to the relatively short flying distance. Scoot will also be cautious to not reduce schedule padding, an absence of which could result in extensive delays and displeased passengers. More likely the carrier will take advantage of current ground time in Singapore to open more medium- and long-haul routes once additional aircraft join the fleet. Another 777-200, combined with existing ground time in Singapore, could permit Scoot to open up to two new destinations. Scoot has previously said it plans to operate by the end of 3Q2012 an initial network of four destinations with an initial fleet of four aircraft. But the decision to also add a short-haul route in Bangkok means Scoot will now likely serve five destinations or possibly even six by the end of 2012. Additional medium-haul destinations in China, Korea and Japan are now being evaluated. Scoot has already taken delivery of two 777-200s, which are now in the process of being overhauled and retrofitted ahead of the launch of services to Sydney and Gold Coast in June. Its third 777-200 is slated to come out of the hangar by the end of June while its fourth and final 777 for 2012 is slated to enter service by the end of July. As Tianjin is not being launched until August, at which point Scoot should have all four aircraft in service, an additional North Asia destination could be launched ahead of Tianjin. With Scoot now willing to also play in the short-haul market, a second short-haul route is possible for a total of six routes - two to Australia, two to North Asia and two to Southeast Asia. Scoot could also potentially squeeze in two Australia, three North Asia and one Southeast Asia route with only four aircraft although such as scenario is unlikely. The SIA Group this week holds 41.9% of capacity between Singapore and Bangkok, with SIA accounting for 25.7% and Tiger Airways 16.2%. Scoot's capacity will be slightly over half that of Jetstar Asia, which holds 9.2% of capacity this week, and will be injected in a tightly scheduled slot that already sees numerous SIA and Tiger Airways services. It would not be surprising to see Tiger Airways adjust its schedule to reduce capacity in the evening when Scoot operates. SIA could find itself in a similar position. Singapore-Bangkok is not the most high-yielding (SIA deploys its older 777-200s without its new premium product on the route). But the SIA evening Bangkok flight connects to some long-haul flights, including to Australia. SIA would be keen to preserve these connections, in particular for premium passengers, although a tie-up with Scoot could offer an alternative. Scoot's 777s will be configured with a business class which is a significant step below SIA's long-haul premium offering but would be sufficient to meet the needs of SIA premium passengers for regional connections. Scoot will introduce a middle-level offering: low-cost but friendly and, the carrier hopes, pleasant to fly with. As Southeast Asia continues to shift from full-service carriers to LCCs on shorter routes, SIA wil be pressed to maintain its existing capacity if Scoot maintains its presence on the route. The dilemma is notable as Scoot was set out to complement SIA and not ever replace it. SIA intends to use Scoot to serve heavy demand destinations, like Sydney, while opening second-tier points like the Gold Coast and Tianjin. Qantas, Jetstar, however, set out with a similar mission and has increasingly taken over Qantas routes where Jetstar can be profitable or more profitable. Scoot's service to Tianjin, from 23-Aug-2012, follows in the footsteps of the region's other low-cost, long-haul carriers. AirAsia X made Tianjin its second destination (after Gold Coast) in 2007. While AirAsia X had preferred main airports, the carrier at the time had to serve alternative airports as a result of government-imposed restrictions favouring national carrier Malaysia Airlines (MAS). In Jun-2011 AirAsia X finally had those restrictions lifted and spoke of opening services to main airports, but the Aug-2011 share swap between AirAsia and MAS effectively meant the two were no longer competitors. AirAsia X has ceded territory to MAS by withdrawing from London and Paris, making it unlikely to launch to primary airports like Beijing. Jetstar last year opened a Singapore-Beijing service. Qantas, however, only serves Shanghai in mainland China (and that service is from Australia, not Singapore). Shortly after Jetstar announced its Singapore-Beijing service, SIA announced an additional Singapore-Beijing frequency that was timed to match Jetstar's. While it could have been used as a holding slot and transferred to Scoot, Scoot and SIA have maintained their approach of Scoot opening alternative airports by having Scoot serve Tianjin and SIA maintain its capacity, including the additional route, to Beijing. SIA is keen to maintain four daily flights on the Singapore-Beijing route and is hoping to later adjust the newly added after midnight slot, which like Jetstar it took as it was the only time available. For now Scoot's short-haul focus is limited to Bangkok and although additional points could be opened, the opportunities are relatively few and Scoot will want to maintain its concentration on medium- and long-haul routes. But the addition of Singapore-Bangkok to Scoot's network still represents a change of strategy with notable implications for other carriers, including other SIA carriers serving the route. Long-haul low-cost carriers in the region have tweaked their model to optimise profitability, even making changes – two classes, connecting flights – some would have called heretical to what it means to be a LCC. But these carriers are increasingly re-defining what it means to be a LCC, with the world's LCCs and in some cases legacy carriers paying attention – either for competitive reasons or to see if they can replicate what Southeast Asia is pioneering. Meanwhile, those airline groups in Southeast Asia which have not yet joined the long-haul low-cost scene are monitoring the developments particularly closely. Thai Airways, which is quickly becoming surrounded by long-haul low-cost carriers, is most likely the next Asian airline group to join the party.